Brakes are one of the most important components of your vehicle, as it enables you to safely navigate the roads and stop when you need to. 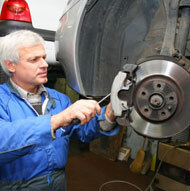 Well functioning brakes are important to keep you and everyone else on the road safe. Our technicians at Master Muffler in Ogden can help keep your vehicle on the road and running smoothly with efficient and affordable brake repair. Your brakes work by taking the kinetic energy of your vehicle and using its own weight and power to slow it down by creating friction. 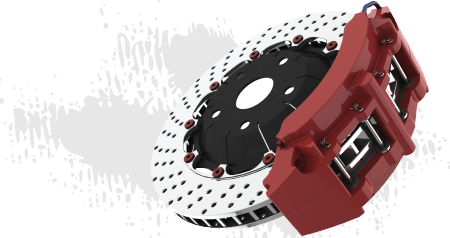 This is done with two main types of brake systems: disc brakes and drum brakes. Drum brakes operate by utilizing brake shoes inside of a master cylinder in each wheel that press against the drum when you want to slow down. Disc brakes use two parallel pads on the wheel and rotor that compress into each other when you slow down. Both of these brakes allows you to stop more smoothly. >Brake Light Indication: Some vehicles have a light that will alert you if it finds something wrong with the brake system.